HATE CARDIO? WELL, NOW YOU DON'T HAVE TO! 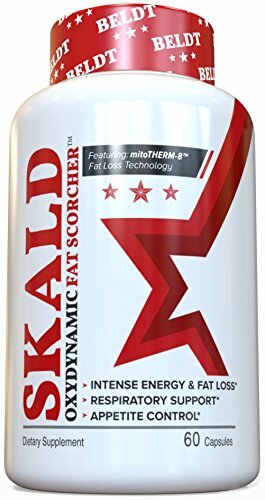 SKALD: OXYDYNAMIC FAT SCORCHER - ASTOUNDING ENERGY & FAT LOSS LIKE NEVER BEFORE. We're not just talking about one of the best fat burners to hit the scene in years (even though it is), we're looking at the world's very FIRST thermogenic supplement that also helps improve breathing. Most top fat burners only cover lipolysis (fat release) and thermogenesis (fat burning). And while both are absolutely critical when it comes to achieving a remarkably lean physique, SKALD goes one step further with enhanced relaxation and expansion of respiratory airways, resulting in increased airflow to the lungs. We are 100% confident that our premium fat burners will meet OR EXCEED your expectations. If you are not satisfied, simply return the unused amount for a complete refund. GRAB A BOTTLE TODAY AND SEE HOW SKALD CAN HELP SHATTER YOUR TRAINING PLATEAUS! CHECK OUT ALL THE STELLAR SKALD REVIEWS BELOW! If you have any questions about this product by BELDT Labs, contact us by completing and submitting the form below. If you are looking for a specif part number, please include it with your message.